Halloween is not such a big thing in Australia (yet!) 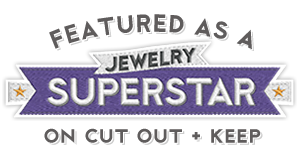 but given that many of you who stop by my blog are international visitors I thought I'd share with you my take on Halloween jewellery. 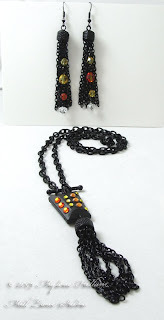 This jewellery set began with a faceted black resin piece cast from Krafty Lady mould AM353 . From the moment I cast it, I knew it was destined to be used in a Halloween project. And when I added the Swarovski flat-back crystals I knew it was going to turn out just the way I had envisioned. It's not often that something turns out the way I've planned it from the start. Most of my pieces evolve as I go along but this was one of those times when vision actually met reality. 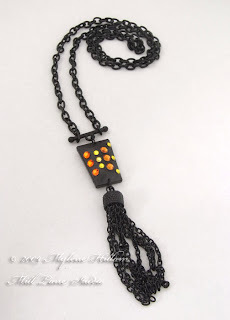 I've added chains, findings and components from Blue Moon Bead's Noir collection which set just the right mood for this necklace. Deliciously dark, yet lots of bling! For a different way to suspend the faceted resin piece, I've used the straight bar from a toggle set. It also gave me a unique and secure way to attach the chain! There were 3 tassels left in the packet I bought so I put 2 of them to good use by making a coordinating pair of earrings. Some dangling Sawrovski crystals complete these neck ticklers. I suppose I could have made my own earring wires out of black wire but I coloured a pair of silver ones with black alcohol ink so that this set is suitably noir. But if anyone has come across black earring wires in their travels, please let me know! Happy Halloween to all those of you who celebrate it! And for Aussie readers, don't forget to enter my decorator rug giveaway. 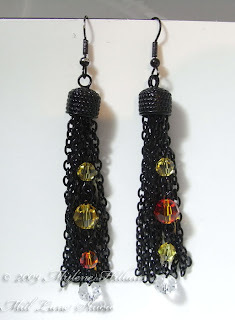 Footnote: The black earring wires are for display purposes only! Update Your Decor for Free! I've been promising you this for days now and finally the time has come to announce the details of my big giveaway. 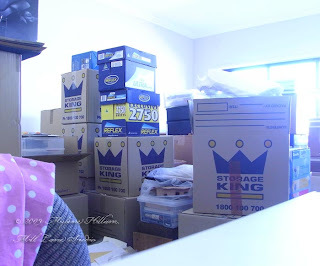 In some of my recent posts, I've blogged about my kitchen splashback AND my new studio, but now let's move on to the living room.... not mine dear reader, but yours! 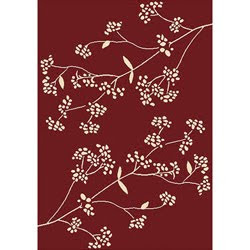 How would you like to improve your home decor with a brand new rug? Just feast your eyes on these little beauties. 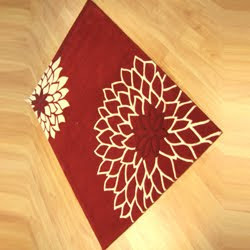 This is just a small sampling of the huge range of rugs available at Buyster. I really wish I was elligible to enter this as my living room floor is still bare and they have so many rugs that I'd love to have in my own home. 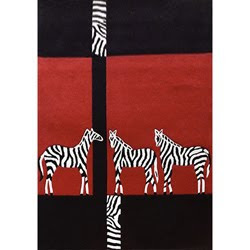 But anyway, the wonderful folks at Buyster are kindly making available a $100 gift voucher for one of my readers to purchase the rug of their choice. And all you have to do to be in the running is have a look at their rugs and tell me, in 25 words or less, what it is that appeals to you most about the rug you'd like to win. This offer is only available to Australian residents, sorry. Entries close on Friday 6th November and I'll announce the winner soon after. Don't forget to leave me your email address so that I can contact you if you're the winner. The closing date to leave your comments has now been extended to 20th November 2009. It's eye candy day again today. Resin is such an addictive medium... I tell you, once you start playing with it, you just don't want to stop. And as I promised yesterday, here are a couple of resin necklaces strung with a mixture of glass and lucite beads. 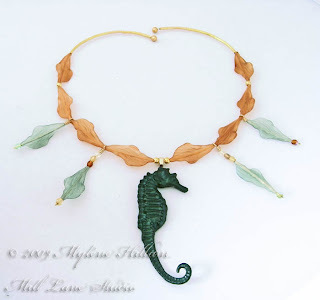 I love this seahorse - I've used it in many projects before but never as a piece of jewellery. I cast it some time ago but somehow I never found the time to make it up. It's a fairly large piece (about 7cm) and it's actually black resin coloured with Duo Blue Green Pearl Ex and it has a very subtle sparkliness (is that a word?) about it. I've teamed it up with these gorgeous lucite leaves which remind me of seaweed! This one is an interesting piece! It started out as a heart with rococco texture impressed into it..... very nice, but hard to see in the photo. With a little bit of creative trimming I was able to carve out a niche to sit the glass flower bead into. It's finished off with a Swarovski crystal as an added accent. That's it for today. But for all you Aussies out there don't forget I have a surprise for you which is coming up in just a few days time. Shhhh, can you keep a secret - I'll give you a hint.... it's a giveaway. But you'll have to keep tuning in to find out what it is. I promise, you'll love it! Two weeks have passed since the big move and I still have no internet connection. 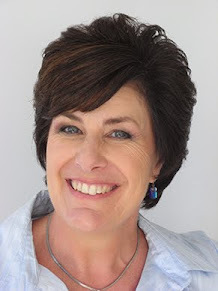 It's hard to blog and keep in touch with the virtual world without it, so forgive me dear reader that my blog posts have been few and far between of late. But, life without the internet goes on, and that means that between unpacking my new studio and cleaning the old one that there has been time for some creating. 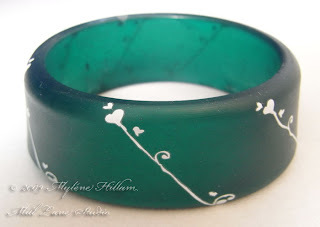 I always enjoy playing with resin so today's offerings are bangles. 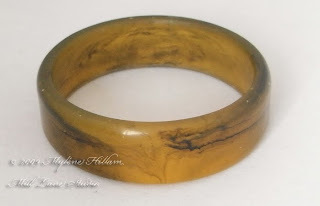 The first one is a marbled bangle, very loosely described as Tortoiseshell. It is quite transparent which the photo doesn't show and it's actually a light shade of orange but the black swirl is giving it more of an amber cast. It's buffed to a very nice shine! 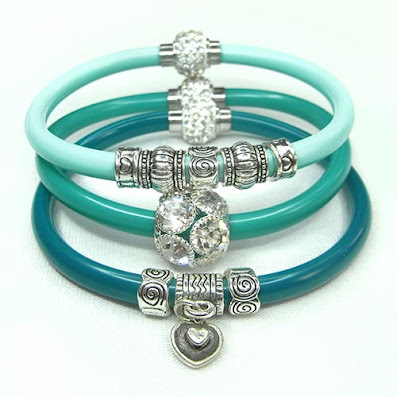 The next one is turquoise - one of my favourite bangle colours. Don't the white tendrils look so crisp against the translucency of the turquoise? This one is called Turquoise Tendrils. And the last one for today is fun and funky! 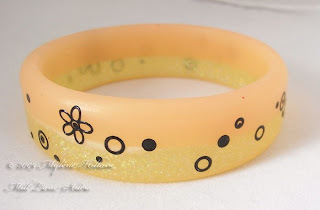 A two-toned bangle where one half is sparkly lemon and the other is a lovely shade of apricot. It's called Bubbles. These will all be available for sale from the resin gallery on my website Mill Lane Studio as soon as I have internet connection again. 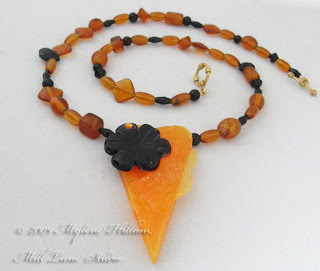 But in the meantime, I will have more resin eye candy to share later in the week - the next instalment will be necklaces. Oh, and I have a wonderful surprise for all my Australian readers later in the week. So keep checking back. Following on from the photo of my new kitchen splashback, I thought I'd also invite you into my new studio. It's just bare bones at the moment....... a nice big, open space with a bank of overhead cupboards, a bunch of underbench cupboards and a bench that is some 6 metres long which includes a computer work station. I'm one very lucky girl! As you can see, I have an abundance of light - the lovely big picture window is more than 3 metres wide. The drawback is that it's on the western side of the studio, so come summer, OUCH! it will be hot, but that's a small price to pay for the daylight I'll have to work in. You can now see I've begun to move into the studio and this is the first lot of some 30 cartons which are now piled into the centre of the room. The furniture is still to come but now that I've begun to unpack there is no bench space left to work on. Where did that 6 metres of bench space disappear to? It's a slow process but stack by stack, the boxes are dwindling and items are finding their way to the general area they'll live in. 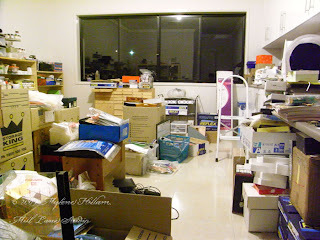 And then, as I have time, I will organise each area so that I can find things which at the moment is not so easy to do. I don't even remember unpacking some things. 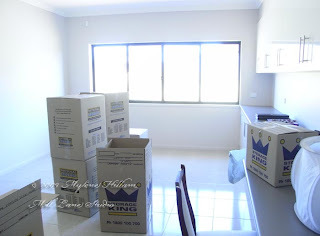 Maybe the unpacking fairies go to work at night when the lights go out! OK, I know that's wishful thinking but it would be wonderful to have such helpers on hand! Given time I will find places for everything (and hopefully I will find everything I packed!! ), and that wonderful benchtop will be clear enough to become a work space again. But in the meantime, I'm weeding and sorting as I open the packing cartons. The "Must find new, loving home" pile is growing. I think I see a garage sale in the future!. Remember that photo of me holding up the different coloured sheets of 12 x 12 cardstock against my new kitchen wall a few weeks back? Well I thought you might like to see how that translated into a glass splashback. 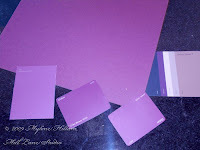 After selecting the perfect colour from the cardstock (Bazzill Purple), we then had to colour match it to a regular paint colour and provide the glass manufacturer with the brand, name and code of the colour. Now this is where it got tricky because there are paint colours..... and then there are Bazzill colours. We had narrowed the choice down to about 5 shades and all of them were close...... very close. But none of them was quite right. It took more than a week of checking the paint chips in various lights until we eliminated them, one by one. And finally, we were left with just one - Dulux Jewel. 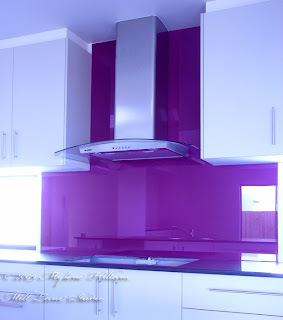 And here it is - the finished glass splashback. Now that's purple! .....and I love it! For all you Friendly Plastic fans out there here's a couple of techniques you might like to try. FaveCrafts.com has just uploaded these projects to their extensive craft library along with full instructions. 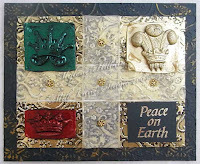 The first card, called Three Kings, involves casting Friendly Plastic into Krafty Lady Art Moulds. Friendly Plastic and Krafty Lady Art Moulds are a match made in heaven. The flexible silicone makes demoulding a breeze. Look at the fantastic detail the Friendly Plastic has picked up. The second card, Unique Florals, combines the marbling technique with cookie cutters to create the interesting floral embellishments. This card uses both the marbling comb and a needle tool to blend and marble. Click on the card names to take you directly to Fave Crafts website where you can print out the images and instructions. I'll also be a guest blogger on the Fave Crafts blog in the coming weeks sharing a little about my work with Friendly Plastic so stay tuned for an update.